What is it like to be black and queer? The intersectionality and multiplicity of this identity is explored by Stephen Jackman-Torkoff, Tawiah Ben-Eben M’Carthy, and Thomas Olajide who each have unique histories and circumstances as black gay men living in Canada. Jackman-Torkoff grew up as a foster kid in the Toronto area, M’Carthy is a Ghanian-born Canadian living in Toronto, and Olajide lives in Toronto and is originally from Vancouver. Although much of this show felt like a collection of vignettes about each actor’s past and present experiences of being black and gay (extremely thoughtful though those were), there were a few moments where if felt like the themes of what these three men were expressing really hit home. The best scene comes after Jackman-Torkoff performs an ode to Josephine Baker, complete with banana skirt. He then collapses to the ground and sings a heart-wrenching rendition of “Amazing Grace.” Olajide stops him, expressing concern that it’s inappropriate to use the song in their performance due to the fact that it was written by a white slave trader. The lively debate about “Amazing Grace” brings out the complexities of each of their identities, including M’Carthy telling Olajide he doesn’t know what the black immigrant experience is like and Olajide saying to Jackman-Torkoff, “You’re not white, but are you black?” referring to his mixed ethnicity. They also bring up the idea of “passing,” telling Olajide that things are easier for him because he can pass as straight. Amidst all the serious themes about race and sexuality, there is an abundance of humour in Black Boys. The whole audience was laughing as Olajide, in a scene from his youth, masturbated to pictures of women but couldn’t help picturing Mario Lopez from Saved by the Bell. Another highlight of this diverse show was the dance sequences. Olajide stood out as a particularly articulate mover, while the interplay among all three men added emotional depth to the content. 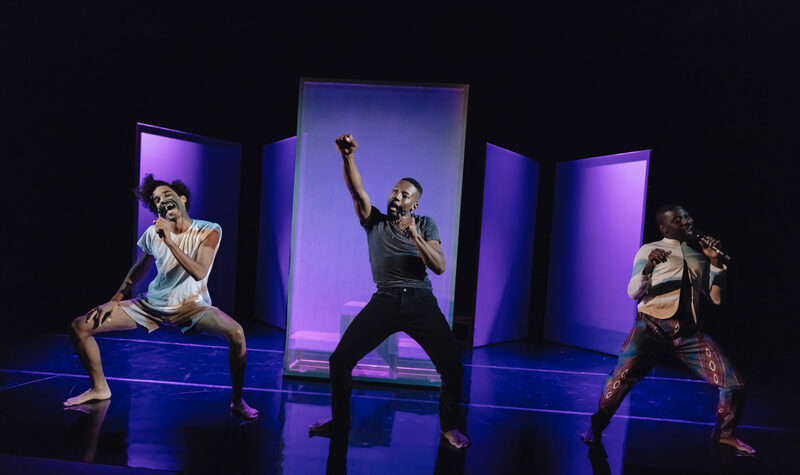 Through song, dance, spoken word, poetry, burlesque, and storytelling, this trio manage to pack a hell of a lot of content into their 95 minute show. After expressing their unique talents, individual narratives, and collective concerns, the audience is left not only entertained but with a lot to think about.